The LT1200 panel mount process indicator is a precision digital indicator for interfacing to and measuring most process variables. The LT1200 is capable of measuring and processing variables such as mA, volts, potentiometers, frequency and counting, and also has built-in functions such as an event timer, real-time clock (RTC option required) and a manual analog output station (Analog out option required). The LT1200 also includes a multiple output excitation voltage selection for sensor excitation of two or three wire transmitters, encoders, potentiometers and more. Calibration of the analog process variables is simply done by either entering in the display range selection or by direct sensor injection calibration. 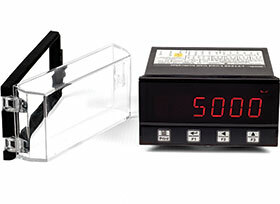 The high bright 6-digit 14-segment LED displays make for easy setup and readability. A simple menu system with built-in help hints allows for easy configuration of display and sensor settings. A universal mains switch mode power supply (85-264 VAC) is provided as standard but an optional low voltage (10-30 VDC) isolated power supply or a high voltage (25-70 VDC) isolated power supply can be installed. RS-232 communications is supplied as standard with the Modbus RTU and Modbus ASCII protocol. A simple ASCII out protocol is also provided for serial printing and communicating to large displays. A second communication RS-485 interface can be added if required. The LT1200 also has an analog out, or an isolated analog out, option to generate a precision 0/4-20 mA and 0-10 V analog output signal. Other advanced features include user input linearisation, max/min recording, programmable front push buttons, programmable digital inputs, security menu lockout and advanced digital filtering to provide a truly universal process indicator.